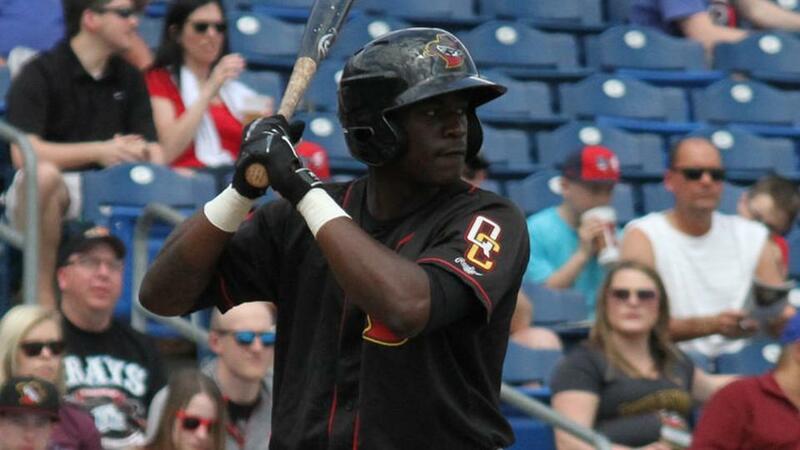 Daz Cameron was just trying to break out of a slump. He nearly made history in the process. Houston's No. 5 prospect went 4-for-5 with three RBIs and fell a double short of the cycle as Class A Short Season Tri-City beat host Lowell, 8-3, on Monday. The 19-year-old outfielder singled to center field in the first inning and went deep for the first time as a pro in the fourth, hitting a two-run shot over the left-field wall at Edward A. LeLacheur Park. Cameron added an RBI triple to center in the sixth and capped his day with an infield single in the eighth. "He got himself into an advantage count. It was a 3-1 fastball, a mistake pitch that was left up and out over the plate," ValleyCats hitting coach Dillon Lawson said of Cameron's homer. "He absolutely hammered it. Got the barrel there on time and put it over the left-field fence pretty easily. "From a swing standpoint, we saw a lot of the same stuff. He's been working extremely hard on refining his swing and taking advantage of his athleticism and incorporating that into his swing. He's done a phenomenal job of that since the season started. Today, he was finally able to put everything together. You see what the outcome was, it was a pretty special night." A first-round pick in 2015, Cameron opened this season in the Midwest League, playing for the Class A Quad Cities River Bandits. The Georgia native batted .143 with six RBIs in 21 games and was reassigned to Tri-City on May 2. "I think it helps to know what it takes to be successful at each level and getting experience, even if it's brief experience," Lawson said. "It helps you to be better prepared as you move forward. Really with all the experience, he's getting a better understanding of what it takes to be successful at the big league level." In 10 New York-Penn League contests, Cameron is batting .267 with a .797 OPS and 11 RBIs. The son of former Major League All-Star Mike Cameron had struggled in his previous five games, going 3-for-21. But his coach expects Cameron's confidence should be on the rise now, even if his charge doesn't need that to succeed. "There's no doubt that a night like that can create a lot of momentum," Lawson said. "But one of the best things about Daz is that it doesn't really matter if it's going well, it doesn't matter if he's struggling, he works just as hard every day and is focused on development regardless of the results. It's hard not to run with a day like today and feel good and have a lot of confidence when you step up to the plate." Carmen Benedetti homered and drove in two runs while Taylor Jones scored twice for Tri-City. Hector Perez (1-0) earned the win in relief, giving up one hit and two walks while fanning four over 4 2/3 innings. Tucker Tubbs tripled home a pair of runs for the Spinners.